We've redesigned our entire backyard this year and have been hard at work rearranging, creating new garden boxes and re-purposing our old patio. Part of all the movement included digging up hundreds of our old strawberry plants and replanting them in their new home. We've got a whole dedicated area for them now and hope they go crazy and produce tons of new berries. We figured with all the movement they wouldn't produce anything this year but after getting them back in the ground, they perked right up and are now in full blossom and ready to fruit! Our Minnesota winter puts us behind most of the country though so it will still be a few weeks before we get to pick the fruit. I think fresh strawberries are the signal of summer for so many people and when we can't pick our own I love seeing the prices drop and can pick up a few pounds at Costco for a few dollars. We always talk about buying a whole bunch and making jam but most of the time we just eat them fresh. 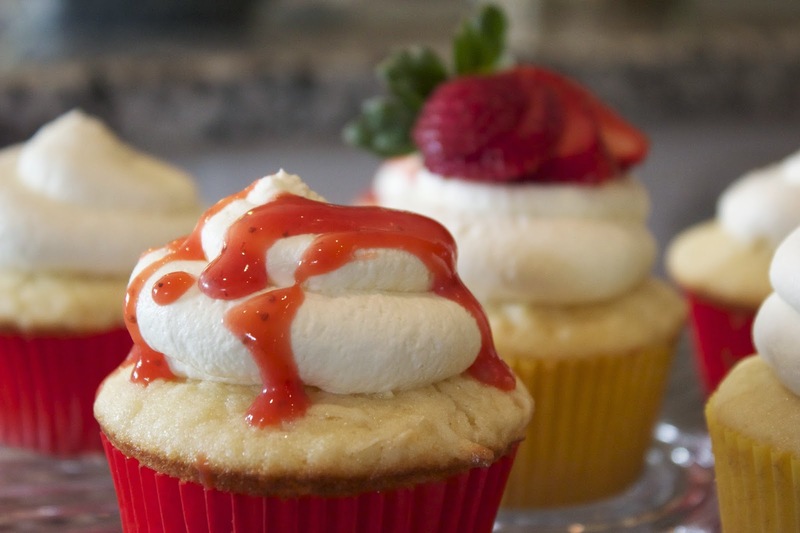 I wanted to create these cupcakes as a twist on the traditional strawberry shortcake dessert. My wife isn't a huge fan of either angel food cake or the biscuit version so I decided to incorporate it into a light cupcake, flavored with both lemon and coconut. 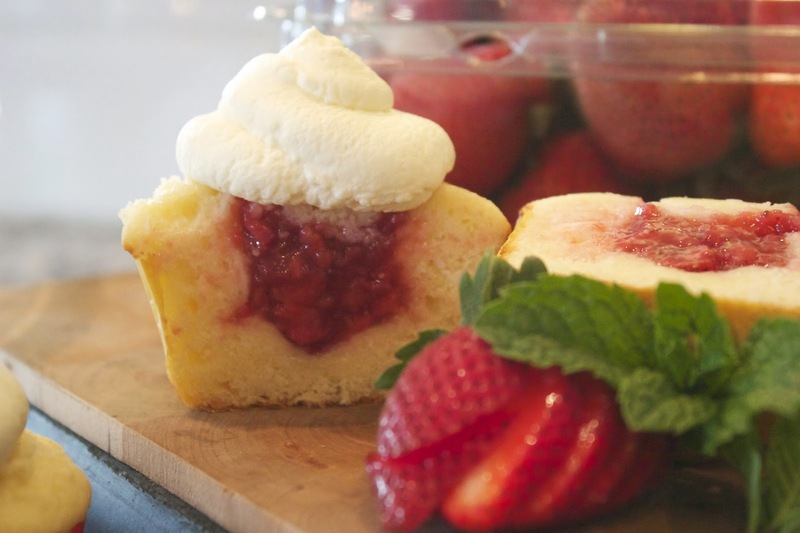 The addition of the fresh strawberry filling and then topping it with light and fluffy whipped cream gives you all the memories of strawberry shortcake but the lemon and coconut bring it to a whole new level. The filling is simply made by cooking down some strawberries with sugar and cornstarch. You'll want it slightly chunky still. I reserved some of that filling and then blended it with lemon juice to drizzle over the top of the finished cupcakes. The extra citrus tang in the filling is perfection. 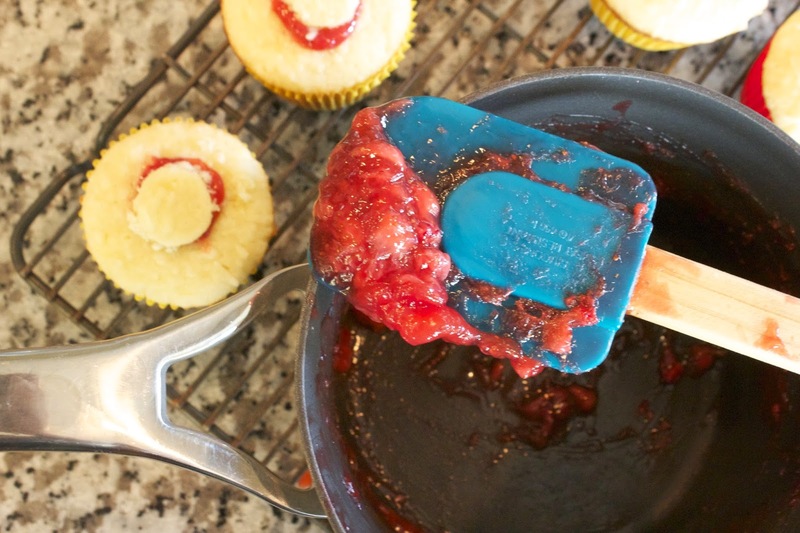 Place strawberries and sugar in a small pan over medium heat. Dissolve the corn starch in the water and add to the mixture. Bring to a simmer and cook for 4-6 minutes or until strawberries have started to break down and the mixture has thickened. Let cool while you prepare the cupcakes. Preheat oven to 350 degrees. Line a 12 muffin tin pan with liners. In a medium bowl, sift together the flour, baking powder and salt. In a stand mixer, cream together the butter and sugar until light and fluffy about 2-3 minutes. Add the eggs one at a time, mixing until combined. Add the vanilla, coconut and lemon peel and mix until combined. Mix in half off the flour mixture at low speed. Add the buttermilk and then the remaining flour mixture. Divide the batter among the prepared muffin cups, filling them about three-fourths full. 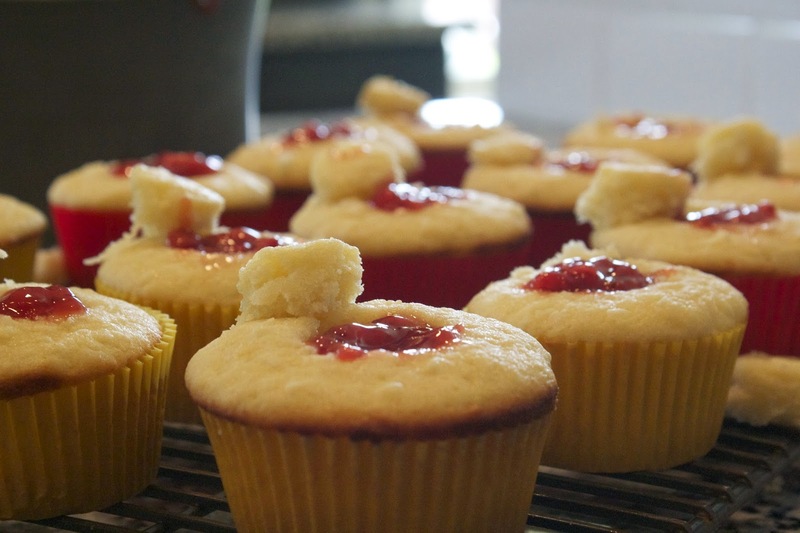 Bake until lightly golden and a toothpick inserted into the center of a cupcake comes out clean, about 16-18 minutes. Let cool completely in the pan on a wire rack for 5 minutes. Transfer the cupcakes to the rack and let cool completely, about 1 hour. 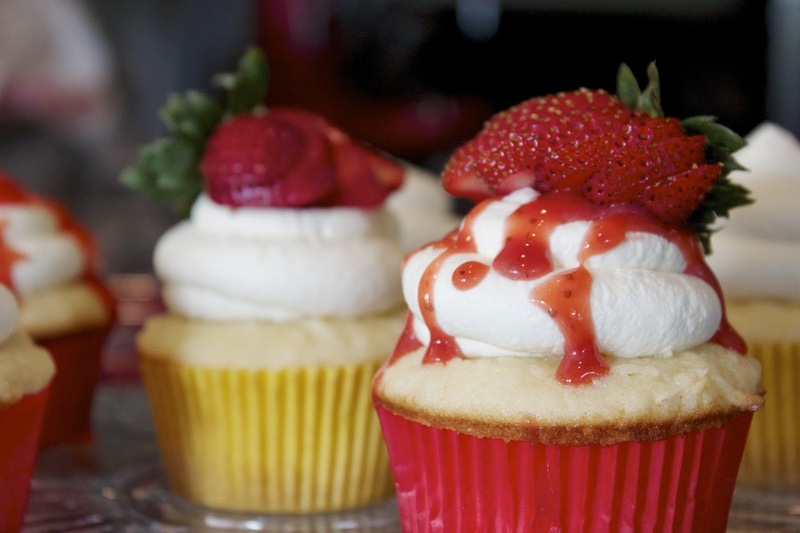 Using a paring knife, create a hollow about 1 1/2 inches in diameter and 1 inch deep in the center of each cupcake. Fill each hollow with a spoonful of the strawberry mixture, reserving 1/2 cup of the mixture. Replace the top of the cupcake and pipe on the fresh whipped cream. Take the reserved 1/2 cup of the strawberry mixture and thin to desired consistency with lemon juice in a food processor. Drizzle over finished cupcakes. Disclaimer: This post is not sponsored. 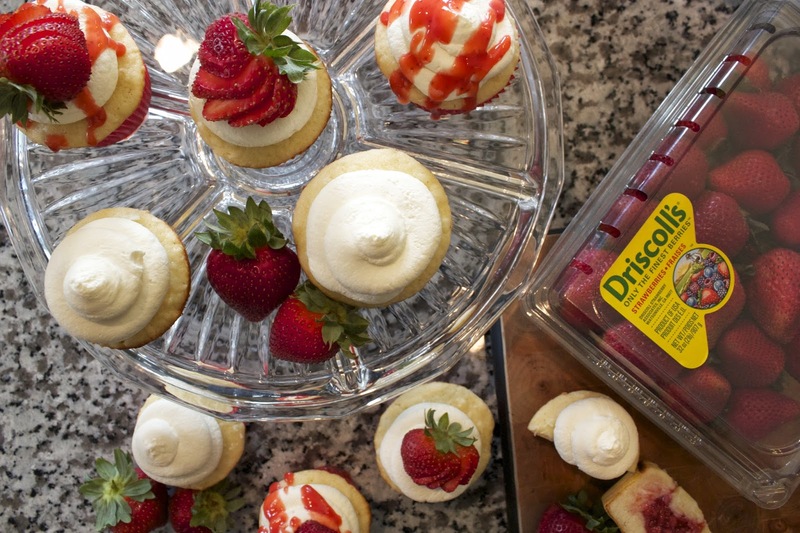 It is an entry into a contest sponsored by @Driscollsberry and #StrawShortcake and if I win I'll receive a years worth of free berries. Yeah, that would be awesome. WOW! I love these cupcakes. 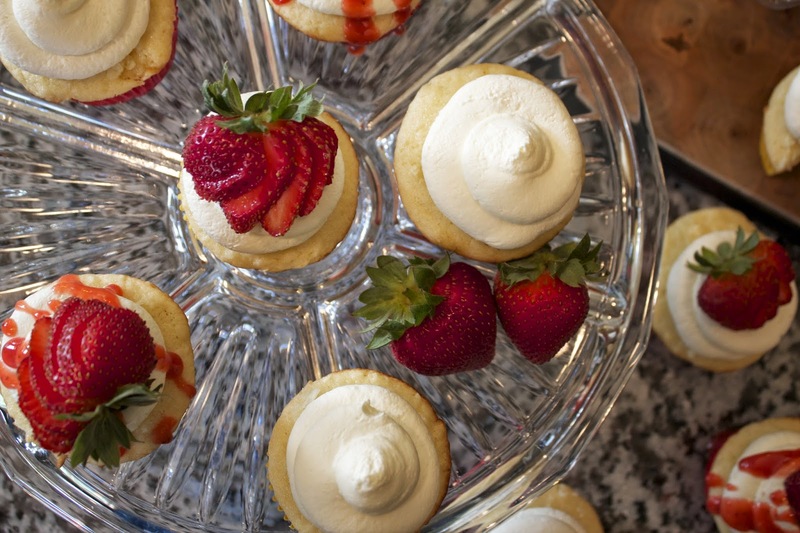 Good thing for me that your wife does not love either the angel food or biscuit variety of strawberry shortcake! !